Yes, I have had it. Working with the VA Regional Office (VARO) is bad enough, but the Disabled American Veterans (DAV) are just as bad. What follows in the laundry list of reasons I fired them. Lets start off by saying something good about the DAV. As service organizations go, it is one of the best, perhaps even the best. It's national service officers are trained by the VA during a two year training period. The DAV is one of the few organizations that has access to VA claims data. The DAV is automated and networked into part of the VA claims system.That is the good news. The best the DAV and other service organization can do with service members claims after the second level BVA or DRO review is about 30 per cent success rate. That means less than 1:3 claims are approved by the VA even with DAV or other service organization assistance. The DAV may be satisfied with this percentage, but veterans should not. A thirty percent success rate is hardly impressive. 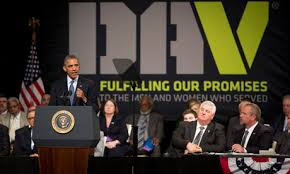 The DAV seems to be too chummy with the VA. We recently met with a DAV National Service Officer (NSO) who listened to our complaints about the VA. We strongly hinted we were about to bolt to an attorney, but the NSO suggested attorneys wouldn't have any better luck with the claim. The second time we met him he repeated verbatim the same pabulum we got back from the VA after a congressional inquiry. The NSO also suggested we were just two retired people who spend all day working on our claim. This was the wrong thing to say to clients, particularly when my spouse works and I am politically active. I spend more time on my FB page and blog than on my VA claim. Perhaps someday that NSO will see this article and get a clue! The DAV's activities are, for the most part, invisible to the veteran. The DAV rarely advises veterans of actions it takes on their behalf. If you fax or mail a letter to the DAV, you might get a letter back acknowledging the receipt and filing, if you are are lucky. They will also advise you of any hearings with the Decision Review Officer (DRO) or Board of veteran Appeals (BVA). That 's about it. On well known VA blogger describes service organizations as mail rooms.He makes a good point. The NSO's abilities vary widely. There are NSOs and senior NSO's. The senior NSOs are excellent but most of the other NSO's have wide variations in ability. In the case of the St. Petersburg VARO, NSOs rarely last more than a year. In an 11 year period, my spouse estimates we have had a minimum of 30 NSOs. Every 90--120 days, the local DAV changes the NSO for a vet based on his or her Social Security number. We recently found out that the St.Pete DAV has never been a training facility. This was a cover story for some sort of a management problem in this office for a long time. Of interest, the number two supervisor in the St. Pete DAV had been replaced in the last couple of months. A 17-year senior NSO also resigned. Not only do the NSOs rarely correspond with vets, it is not common for them to return phone calls either. I can recall perhaps 4 times that the DAV returned a phone call in past 11 years. When my wife thought I was dieing in a hospital, she called 4 times and the St. Pete DAV never returned any of the calls. When my wife thought I was dieing in a hospital , she called 4 times and the St. Pete DAV never returned any of the calls. In New York, a service officer must have legal training. This is not the case in Florida. The St. Pete DAV has abysmal knowledge of 38USC, BVA and USCAVC rulings. The DAV has a tough job, my attorney explained, because they listen to sad stories all day long. They function much like social workers. It is a tough job with relatively low pay, about $48,000 per year. After the major did a smack-down on the VARO during his last BVA hearing, one of the NSOs suggested at the time he apply for a job there because he was "knew more than anyone" in the DAV office. Regardless, this would hardly be the kind of job a person with a technical background would want. You need a real people person as an NSO. In Oct. 20l1 the major suggested the Veterans Benefit Administration (VBA) develop a checklist for veterans who were initiating claims. This was because the new claims process was so haphazard with the local DAV. Not long after that the VA developed the Disability Benefits Questionnaires (DBQ) which the major thinks will help more vets develop successful claims. In many respect, the checklist idea was a workaround for vets who are assigned marginal NSOs. Most of the NSOs appear to be former non-commissioned officers and some have an attitude toward officers. Others NSO's like to talk about their claims which wastes a vet's time. The attorney is right. The NOS's are fundamentally social workers. Listening to the laments of vets who have been physically and mentally wounded wears you down over time. It's a tough job. If fact, it's a job better for an attorney than a social worker. That's why the major fired the DAV. An attorney will return phone calls and you can send them email. An attorney will provide an organized presentation to the DRO. BVA or USCAVC something the DAV will not do. An attorney will also suggest ways you can improve your claim, something that the service organizations rarely do. I posted the initial article on the FB page, "The VA is lying." The VA approves about 15 per cent of its claims overall. If you appeal to the BVA and prevail, about 30 per cent of VA claims make the cut. If you appeal the BVA ruling to the USCAVC, about 70 per cent of those filings are overturned.. 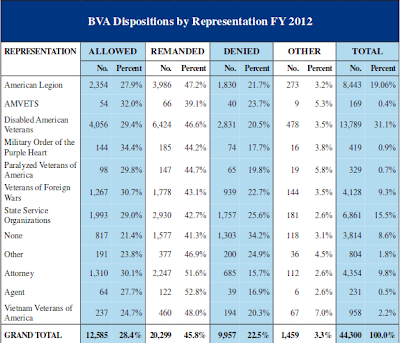 However, only a small percentage of vets who lose a BVA appeal, go to the USCAVC. 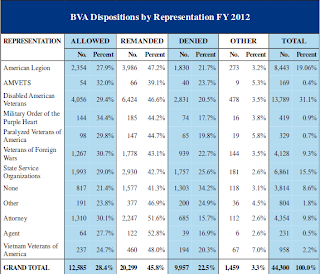 About 15 per cent of VA are fraudulent. This means when the dust clears, about 55 per cent of vets just give up. Perhaps the claim is poorly written or lacks appropriate medical documentation. Most vets just tire of the run-around. If the VA makes an award, the award comes out of the local VA claims office's (VARO) hide. This is really a conflict of interest and may explain why the VA is so stingy. About 40-45 percent of claims from Iraq and Afghan vets are being approved. Not bad. However, if you are Vietnam era vet, it's about 2-4 per cent. Is this a dual standard for vets? You betcha! Essentially if 100 vets were to file claims, about 20 would be approved at the the VA Regional Office (VARO) level. If you are an Iraq and Afghan vet, a Purple Heart recipient, paralyzed or paraplegic, your odds improve. If you appeal to the Decision Review Officer (DRO) or the Board of Veteran Appeals (BVA), another 20 per cent of those appellants get approved. Keep in mind the DRO is bound by it VA Manual, M21-1. It does not consider precedent rulings from the United States Court of Appeals for Veterans' Claims (USCAVC) , the 38 CFR that is the VA directive or 38 USC that is public law. The BVA will consider USCAVC precedent rulings that require a three panel judge, 38CFR and 38 USC. The BVA is legal administrative proceeding. the BVA will also consider the opinions of private practice physicians in letters and Disability Benefit Questionnaires. The VARO will gloss over private practice evidence if it conflicts with the Compensation and Pension (C&P) clinicians findings. Keep in mind that many of the C&P examiners are nurse practitioners and physician assistants. A board certified physician will hold more weight in front of the BVA. Make sure your key physicians have conducted record reviews of you military service records. This is important to the BVA. However, the DRO or BVA base is smaller. Let's says that 50 of the 80 claimants who were rejected appeal. Only 10 would prevail at the DRO or BVA. At this point about 30 per cent of the claims have been approved. However, the BVA may only approve one of your 4 claims and remand the other three back to the VARO for development. You are now playing remand ping pong with the your other three claims. We now have 40 claimants left who didn't make the cut at the DRO or BVA. These appellants can apeal to the USCAVC. If 10 appeal, about seven will prevail. These examples are hypothetical and based on limited data the VA has provided on claims. Much of this information was harvested from congressional testimony. Of the 33 remaining claimants. about half (15) are fraudulent. If you file a fraudulent claim, you will most likely receive a quick reject. You can also be prosecuted. It behooves the vet to appeal if he/she have a well grounded claim. The writer recently discovered he was very fortunate to prevail in front of the BVA without an attorney. Generally, once you get into appeals, you should probably hire an attorney. Once you appeal to the USCAVC, the claim is locked. You cannot introduce new evidence. What do these statistics suggest. Appeal, young person, appeal! Your odds of winning are highest at the USCAVC level, but you better have a solid claim. You cannot introduce new evidence once the BVA hearing is over. graphics: courtesy of AskNod blog. 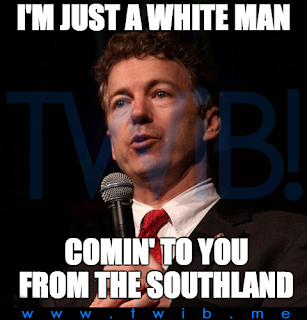 The details are murky, but somehow the brazen Rand Paul stormed his way into the White House. He was greeted by the first dog, Bo, who promptly urinated on his trousers. 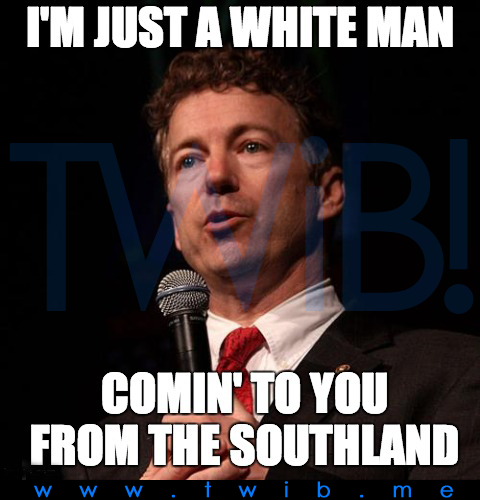 This angered Rand Paul, who said, Bo, a Portuguese water dog, was an undocumented illegal. Paul also claimed the dog was 47 per cent black like Obama. Bo is a black dog with white paws. Paul said Bo was an uppity dog who needed to go to back to obedience school. GOP: An anit-social political party. The GOP has been fragmenting for a long time. This started with political purity tests in the 1990s when Republican moderates were purged form the party. The Club for Growth would challenge Republican moderates in primaries, exhausting the moderates war chest. if the GOP moderate limped out of the primary, he/she became easy pickings for the Democratic opponent. When Jeb Bush took the governor's mansion in the 1990s, the FL GOP purged Democrats from appointed positions. It also purged Republicans who worked with these Democrats because they werd no longer considered ideologically pure. Some of this resulted from Newt Gingrich who became the House speaker in 1994. Gingrich discouraged GOP house members form socializing with Democrats. This actually prevented a lot of late-hours political business from getting done in DC. The era of conservatives are different began. Some of this may have been inherited form the Christian right which tried to establish a Christan business community that only right wing Christians inhabited. Rightardia thinks conservatives simply took themselves too seriously. They saw themselves as the wave of the future abut didn't realize their bubble would burst by 2008. Boy, did that conservative bubble burst.! So a cartoon conservative version of Wikipedia called Cosnervapedia was born. If you want to understand the meaning of bias, check out Conservapedia. Conservapedia is a good example of conservative anti-intellectual thought. Neo-conservatism was militaristic in the beginning and brought neo-confederate, militia, white supremacist and libertarian groups under its wing. As the moderates were purged form the party, many Republican ditto heads, Tea Partiers and libertarians descended into fascism. Rightardia considers the lone wolf philosophy of libertarians to be another form of fascism. Ayn rand, was a Russian emigre, Her writing was a counter to Soviet Stalinism. She emphasized the importance of the individual over society. Her work was a reaction to Soviet collectivism. Her books and ideas were not popular after WW2 ended. Rand's idea appealed to the political outsiders, the Republicans that were booted form office during the New Deal. Libertarians want a Utopian society with minimal (minarchy) or no (anarchsit) government. No society on earth has ever had such a government. One libertarian apologist tried to suggest that the US was libertarians prior to the Great Depression. If this bloke had known Us history better, he would have known this was dark period of trusts, 80 hour work weeks, child labor and the struggle for women;'s suffrage. Teddy Roosevelt brought us out of the darkness with his progressive ideas and trust busting. Such thinking about Us history is also historically present minded. Rand wrote her two book, Atlas Shrugged and the Fountianhead after WW2, not prior to the Progressive Era. .
We know know after 28 years of GOP leadership, that Reaganomics and supply side economics (trickle down) simply don't work. 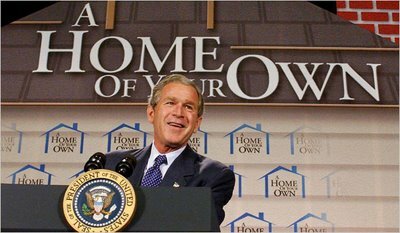 Newt Gingrich rescinded the Glass-Steagall Act and 10 years later our country went into the Great Recession under the watch of GW Bush and his failed ownership society. . When the dust cleared, fewer Americans owned homes than before. This was largely due to GOP deregulation efforts. Treasury secretary Hank Paulsen even reduced the SEC reserve requirements of the big 5 Wall Street banks in 2004. Teh GOP is anti-government. It really wants a seamless relationship between corporate and political leaders. This corporatism is often referred to as the first phase of fascism What the GOP does not want is the effective government that polices the corporate world. The GOP envisions government with a lassez faire approach toward business. In fact, the GOp regularly cuts the budget of regulatory organization like IRS, EPA and the Department of labor when it can. It files the NLRB with "do nothing" GOP cronies and cut the manpower of OSHA to cripple this organizations from inspecting corporations. What we have today is an anti-social political party crowded on the 10 yard line of the right side of the playing field. it is party that has little chance of getting back into the game. All it can do is prevent the game from being played. You can call them bad sports. Rightrdia calls them an anti-social and disloyal opposition. Labels: anti-social, clib for growth.progressive era, ideological purity, Jeb Bush, neo-confederate, teddy roosevelt.ayn rand.